According to research, there is no Oracle Character (Shang Dynasty 1766 -1122 BC), or Bronze Character (Zhou Dynasty Character 1122-221 BC) representation of the Chinese ideogram ‘Ch’an’ (Zen). Instead, this ideogram is first observed as a Seal Character and may be dated as originating sometime between 221BC and 200AD, a time-span of over four hundred years that saw the Qin, the Early Han, the short-lived Xin, and finally the Later Han Dynasties. Seal Characters were developed during the Qin Dynasty (221-206BC), and were used in China to around 200AD. 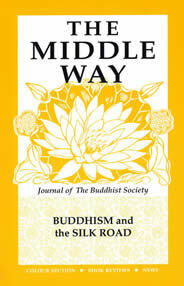 During this time, probably around 100AD, Buddhism arrived in China, brought by Indian Buddhist monks. 5) Oneness of Preoccupation (Ekaggatarammana). The Ch’an method does not go beyond this. Through concentrated insight, the fundamental ignorance of greed, hatred and delusion, manifest by a never ending stream of thought, is uprooted so that the empty and all-embracing Mind Ground may be firmly realised and established in the Mind of the practitioner. The hua tou, kung an and unusual behaviours and utterances of Ch’an masters, all have the single established aim of creating a drill-like insight into the layers of delusion, so that ‘sunyata’,or essential emptiness can be realised. This particle represents an ‘altar’, and is derived from the character 示 (shi4). This represents a person kneeling at a shrine, showing both respect and reverence. A shrine or altar is a doorway to the spiritual world, and may be used to denote a deliberate act of self-cultivation, coupled with respectful behaviour. This particle firmly establishes that the ideogram ‘Ch’an’ is of a religious nature, and that the term over-all represents a spiritual attribute. Interestingly, as a distinct character in its own right, this word pronounced 'dan', has two relevant meanings. The first is that of a net, used to capture animals in the old days, whilst the second meaning refers to an individual – that is a single person – and carries the implication of ‘isolation’, or ‘aloneness’. As a spiritual practice, meditation might well have been viewed as something of an anti-social activity in imperial China, and as such a distinction in its religious function with Confucianism made clear. Confucians advocate ‘Ren’ (仁), which is often translated as ‘Humaneness’, the ideogram for this concept advocates that this kind of spiritual attribute can only be realised in the midst of society, whilst living amongst other people – literally, the ideogram for ‘Ren’ reads as ‘more than one person’. Buddhist meditation, on the other hand, as a solitary exercise, in many ways contradicts the teachings of classical Confucianism, and the above particle may well be representative of this distinction. As a picture of a net, 單 (dan1) - this particle represents animals being gathered into a single place. Buddhist iconology often ascribes animal attributes to delusive aspects of the unenlightened Mind. This highly symbolic representation is very clever when consideration is given to the translation task that confronted Indian Buddhists and Chinese scholars around 100AD. Taken together, the two particles that create the Chinese word ‘Ch’an’ carry the meaning of a spiritual or religious activity (the altar), often performed in isolation, that involves the gathering of scattered thought (symbolised by wild animals), through a one-pointed concentration of the Mind, represented by a net.